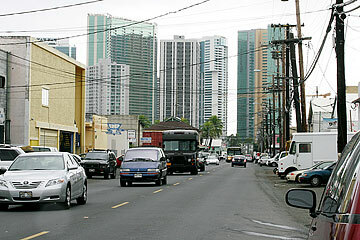 More than two years after the state announced plans to improve a dilapidated stretch of Queen Street in Kakaako, the project has been scrapped. The state Hawaii Community Development Authority board voted unanimously yesterday to cancel the project, known as Improvement District 11. The bottom line: Not enough money. Last month the state learned that the estimated cost to improve the stretch of road between Kamakee Street and Ward Avenue had ballooned to $17 million, well over the budget originally approved for the project in 2004. The state attorney general's office subsequently recommended canceling the $10.8 million contract with Kiewit Pacific Co. If the HCDA wanted to press ahead with the project, it would have to go back to the drawing board, securing state funds and putting the contract back out to bid. Kiewit attributed the higher costs mainly to additional drainage work the city required before improvements could be made. Daniel Dinell, HCDA's executive director, said that while he was disappointed, the HCDA now has the opportunity to work closely with the community and stakeholders in identifying other areas in Kakaako ready for improvements. "These are improvements that we think are very important in terms of creating a vibrant, safe, mixed-use environment that people will enjoy," he said. Cliff Garcia, owner of Tropical Lamp & Shade on Queen Street, celebrated the decision. "We finally won," Garcia told the Star-Bulletin shortly after the board's vote. "The assessment is the big thing. We shouldn't have to pay for it. I'm happy, but I know we need improvements." Garcia was among a handful of small business and property owners battling the project because they felt it was unfair to bear higher tax payments -- which would have added up to an estimated $2.9 million. Garcia's own share would have been about $90,000. He also objected to losing property for wider sidewalks, and parking. Dinell said a good chunk of the payments, about $1.5 million, would have been owed by General Growth Properties, the owners of Ward Centers. The project would have been the third of four improvement projects along Queen Street, which the state originally envisioned continuing on to the Cooke Street intersection. Improvements would have included four lanes of traffic, sidewalks, parking meters, under- ground utilities and a traffic light at Queen and Kamakee Streets. HCDA board members questioned whether there were safety issues on Queen Street. In its current state, the streets are prone to flooding, full of potholes, with ragged edges and no sidewalks. In late 2004, the state authority earmarked $15.6 million in total costs for the project, which included costs for land acquisition, design, construction management and temporary parking. It was originally scheduled to start in March 2005, with 15 to 18 months to complete, then delayed several times before its cancellation yesterday. Dinell said that about $500,000 has been spent on design plans and construction documents for the project, but added that they could prove useful at a later time. HCDA has been under scrutiny for not trying hard enough to get public input before proceeding with redevelopment projects. Plans by A&B Properties, which won a bid to develop 36.5 acres along the Kakaako waterfront, were scrapped last year following public opposition to the sale of state lands. The authority has hired Townscape Inc. as a consultant to help put together a waterfront advisory group for that project. Townscape, which has met with more than 20 groups and individuals thus far, set a deadline of March 16 for all interested applicants. Last year, it hired PlanPacific to engage the public on changes to the mauka area rules in Kakaako, and is expecting a preliminary draft next month. It has also hired Belt Collins Hawaii Ltd. to help revise affordable housing guidelines. "The state screwed up," said Garcia. "HCDA did not do thorough planning by getting the city's approval in advance." Dexter Okada, whose family has operated food wholesale business U. Okada & Co. on Queen Street more than 50 years, said he was breathing a huge sigh of relief. "Most of us were never against improvements," said Okada. "But the way it was designed would have hurt a lot of businesses. Hopefully, from now we can work from a more community-based plan."